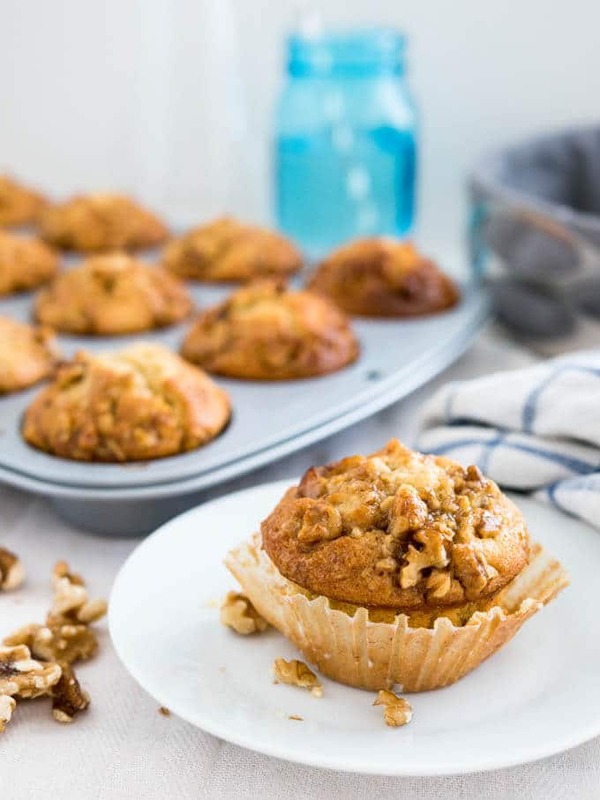 Banana Nut Maple Muffins are on a whole new level! 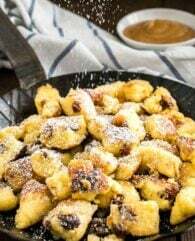 The creamed butter together with the bananas creates a wonderful texture and the caramelized walnuts on top make them a family favorite! Muffins are definitely one of my favorite things to bake. 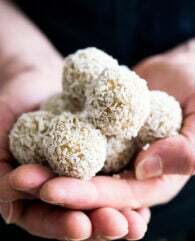 They are so easy to make, freeze great, and you can eat them for breakfast without feeling guilty. And there are so many great flavor combinations! 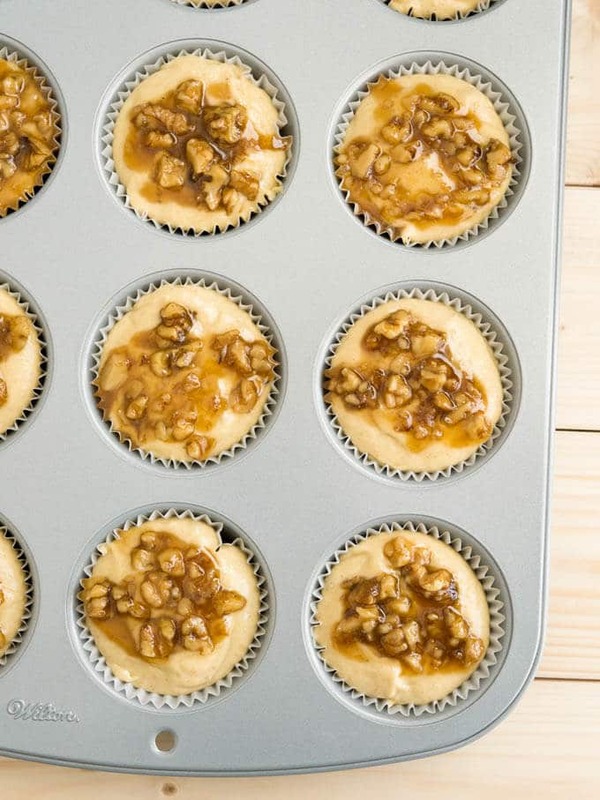 These are made with maple syrup, walnuts, and bananas. Bananas are also the main ingredient in my Banana Muffins with Cinnamon Streusel (obviously) or if you want to try something more fruity have a look at my Raspberry Muffins with Streusel Topping. 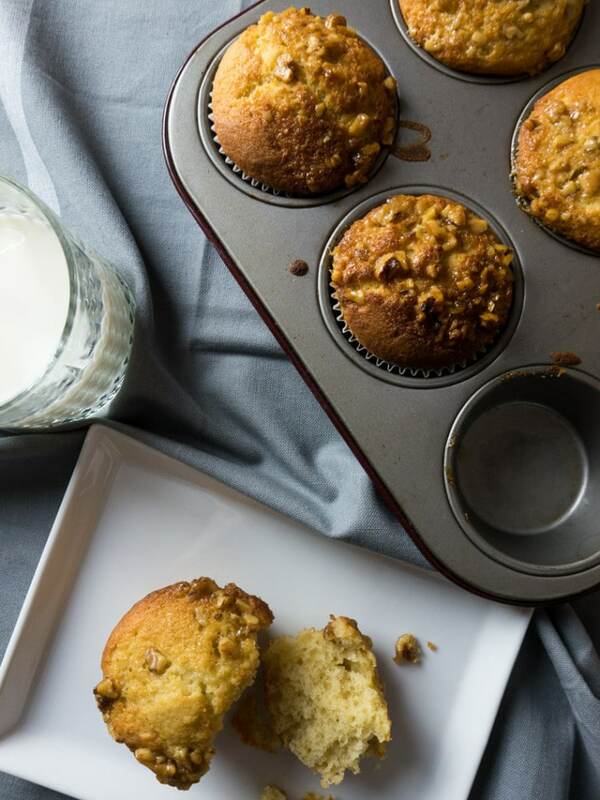 I also made some healthier muffins recently – these Skinny Oatmeal Apricot Muffins are made without refined sugar but they’re super yummy! Today’s muffins are a bit more on the sweet side they make a great brunch treat and will make your kitchen smell amazing! 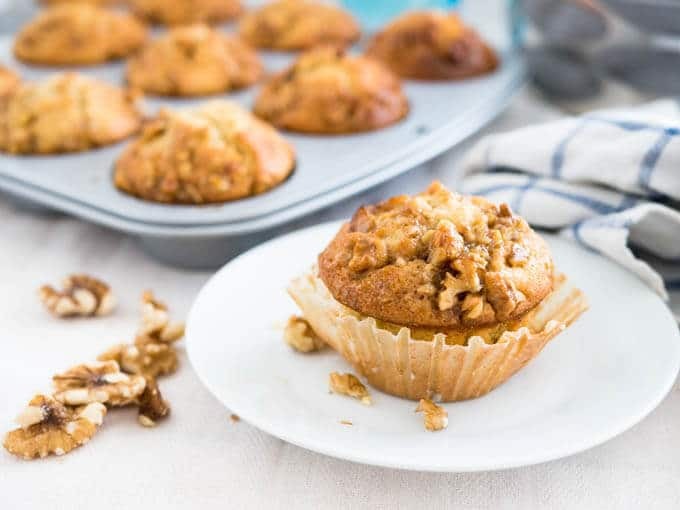 These Banana Nut Muffins with Maple Glaze are a family favorite! And they are really easy to make. The topping is added before they go in the oven, so no messing around with topping afterward. You can eat them right out of the oven! To make the topping melt the butter in a little pan. Add the roughly chopped walnuts and the maple syrup. Let it simmer for 2 minutes and it’s done. Now comes the hardest part – not to eat all the topping before you had time to spoon it on top of the muffins. That’s really hard for me! I often catch myself using extra less topping to have more for myself after the muffins are in the oven. But being more generous with the topping gets you tastier muffins. 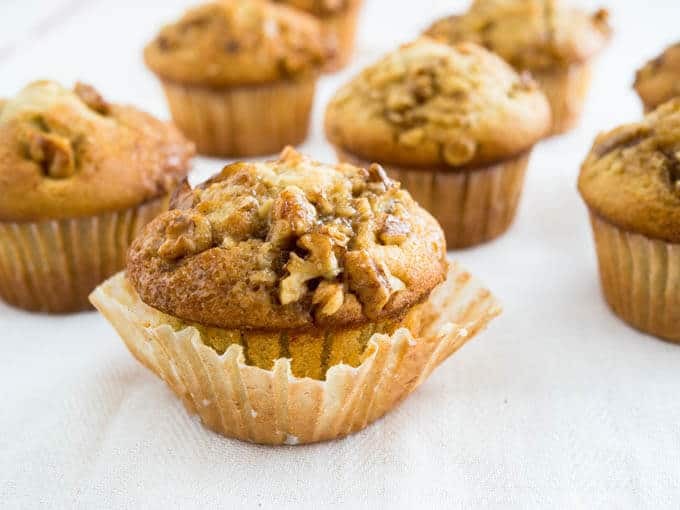 And these Banana Nut Maple Muffins are exceptional tasty! Getting beautiful bakery style muffins with high tops isn’t difficult! There’re a few things to keep in mind but it’s really easy. You have to fill the muffin cups up to the brim of the pan! Don’t be afraid, they won’t overflow. The dough needs to be spoonable, it shouldn’t be runny. 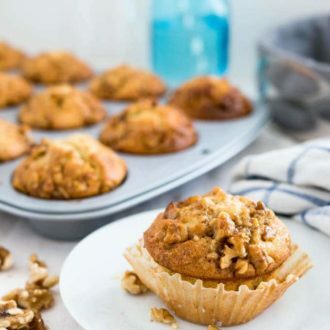 These muffins are a great addition to every breakfast table! And I promise you the maple topping will make you addicted. Preheat the oven to 400°F (200°C). Grease a muffin pan or use muffin liners. In the bowl of a stand mixer fitted with the paddle attachment beat butter and sugar together until fluffy and light for about 4 minutes. Add the maple syrup and mix until incorporated. Then add one egg at a time. Beat for 30 seconds after you added each egg. Mash the bananas and mix with the lemon juice. Add to the mixture. In a small bowl mix flour, baking powder, salt, and cinnamon together. Add dry ingredients to the wet mixture and mix until just combined. Don't overmix! Spoon the batter into 12 muffin cups, making sure each one is filled to the top. You want to fill the batter to the brim because the muffins will rise higher. For the topping: Melt the butter in a little pan, add chopped walnuts and maple syrup.Let it simmer at medium-low for 2 minutes. Add 1 tsp of topping on top of each muffin. 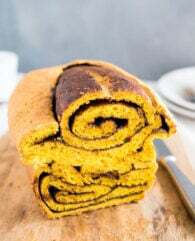 Bake for 5 minutes at 400°F (200°C), then reduce the temperature to 350°F (177°C) and bake for another 15-17 minutes, or until a skewer comes out clean. Cover leftover muffins tightly and store at room temperature for up to 4 days. Or freeze muffins for up to 2-3 months. They look delicious! Walnuts and maple syrup are among my favorite ingredients. From one muffin lover to another, thank you for this great post with those beautiful pics! Now, these are the kind of muffins I need to start my day! They look so delicious! MMMMM! I’m always on the lookout for a good muffin – I think this would be great on Christmas morning — or any other day of the year – LOL! Thank you for sharing. Love your pix! I always have muffins in the freezer too. They come in very handy at times. I absolutely love the sound of these, can’t wait to try them. Freezer muffins are the best :-) Thank you for your comment, Cristie! What a delicious recipe! 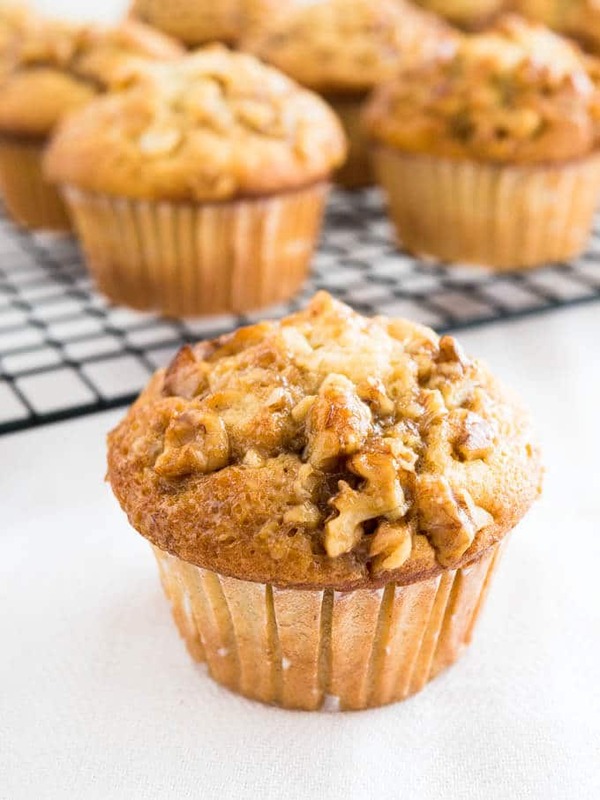 These muffins look really fluffy and I love the addition of maple and walnut.